The Procter Custom Woodworking Showroom and Corporate Headquarters is located in Missouri City, TX. Please call to make an appointment to visit or we can come to you for a free in-home estimate! For over 30 years, Steve has been designing and building a wide array of projects in wood, ranging from high end kitchens and furniture to intricately detailed Victorian playhouses and carved rocking horses. Commissions are custom built to fit the residence or commercial establishment, including cabinets, bookcases, entertainment centers and entire home theaters with elaborate architectural trim. 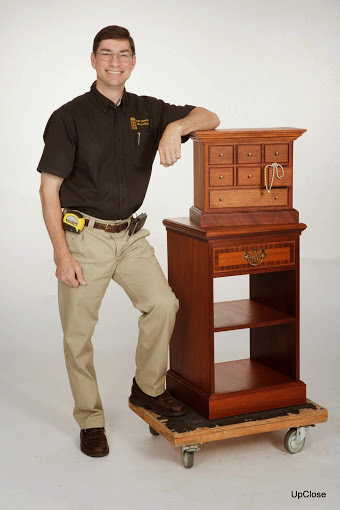 He is the president of the Houston Woodworkers Club and a member of the Society of American Period Furniture Makers. Steve is an engaging and entertaining speaker and an expert on cabinet construction. He has created informative presentations on many aspects of his work, including custom cabinetry, furniture design and architectural trim & molding for woodworking clubs, youth groups and high end architectural firms. He has tutored students and mentored colleagues in cabinet construction and fine woodworking at his well equipped shop. Steve took fine woodworking courses in college and began building furniture in the bedroom of his apartment, soon graduating to a shop and making custom work for clients. His current showplace shop has been featured on tours for the Houston Woodworkers Club. He has built both residential and commercial furniture and built-ins for numerous clients over the years, with many repeat commissions from satisfied clients. Some of the projects in the photo galleries are full of surprises- secret door bookcases, hidden drawers, removable panels and recessed wheels that add functionality and fun.